It's been close to an inevitability for a long time, and Sebastian Vettel today made it official. He's the 2011 World Drivers' Champion, his second world championship and he's not even 25 until next year. Not bad work. In reality, this title has been Seb's effectively for a long time. From the point cars first turned a wheel in the opening weekend at Melbourne Seb's been a stride ahead of all others. His results in the opening eight rounds were six wins and two second places, and had the Chinese round been five laps and the Canadian one lap shorter he would have taken a clean sweep. That period also included tracks such at Monaco and Canada that were supposed to trip him up, but Seb has spent most of the season proving doubters wrong. Barring strange happenings, such as Niki Lauda's fiery accident at the Nurburgring in 1976, in the history of the sport drivers don't squander that sort of early advantage. And despite the briefest of mid-season troughs that advantage has continued and been extended as the year has gone on. The numbers are striking testament to his persistent command: he's won nine of the fifteen races, claimed 324 of the 375 available points, and taken twelve pole positions (and counting, in all three cases). Indeed, going into the Japanese race Seb had led 582 of the 839 racing laps this year, almost six times as many of the next best, the 99 laps led by Lewis Hamilton. Seb's presence at the head of the pack has been ubiquitous, only in Germany was he not on his game, and only there did he finish off the podium. Watching Seb's races this year has been a little like watching a film on a loop. The Vettel copybook is clear. First off, claim pole, and Vettel's scintillating speed and absolute assurance on a single flying lap usually ensures this (can you think of an error from Vettel in qualifying this year? No, I couldn't either). Then Seb takes the lead at the start, and the first lap is like flicking a switch, he's on it immediately and in most races this year he's been seconds clear at the of the first lap, leaving the opposition on their knees from the very beginning. He then gets himself enough of a gap to be outside the DRS 'window', so not to inflate the following car's speed, as well as to be able to react to whatever those behind do in terms of changing tyres, vital in a season wherein tyre performance has varied markedly, duration of tyre life is limited and frequent pitstops have been necessary. From that position, Seb goes as fast as he dares with regard to his tyres, his steering input meaning he keeps his in shape longer than many around him (including that of his team mate - a vital component of his increased advantage over Mark Webber this season compared to last). At Australia, Malaysia, Turkey, Valencia, Monza and Singapore the story has been almost identical. But the new level Seb has reached can be traced back even further: all the way back to the Belgian Grand Prix of 2010. That was a race wherein Seb finished well down the pack, his race ruined by a collision with Button, entirely Seb's fault after losing control of his car attempting a passing move. It was the latest of a number of incidents, some of which were Vettel's own errors, that squandered much of the technical advantage conferred by the Red Bull. After the race it was open season, with many, especially from the McLaren camp, lining up to trash Vettel's reputation. But if all of this was the ultimate test of Seb's mettle he came through it superbly. After his long dark night of the soul he went on a stellar late run to win the title by a nose at the last race, even overcoming an almost certain race win being denied him by a late engine failure at Korea. 2011 has just been a continuation of this. Taking this period as a whole he's won 12 of the 21 F1 races. So, mental toughness and an ability to compartmentalise and not to dwell on setbacks is a clear Vettel trait, and one he's put to good use in 2011. There has been the odd setback this term: he crashed in practice in Turkey and Canada, as well as slid wide and ceded a race win to Button on the last lap at the latter venue, and his run in Germany was subdued and featured a spin in the race. But in each case he bounced straight back: he took pole and won easily in Turkey, also took pole against the odds in Canada and very nearly won, took the pole and won comfortably at Valencia after the Canadian race, and after Germany he claimed pole at the next round in Hungary and extended his championship lead on race day after a sensible drive to second place in tricky conditions. With all of this it's amazing that Seb's spent much of the year being subjected to criticism from many onlookers. They tended to revolve around the view that he's not a great driver, but merely a good one who's found his way into a great car. Others claim that he has a tendency to make mistakes under pressure as well as can't race in the pack and can only win from the front. To deal with each in turn, it can't be denied that the RB7 is a great set of wheels, but it also can't be denied that Seb has absolutely maximised its potential. Even ignoring the obvious point that no one has ever won a race or a championship without access to a car capable of it, it also seems to be forgotten that there are two Red Bulls out there this season, and the other, driven by Mark Webber (no slouch he), hasn't even won a race, and has only led for 17 laps in total. Indeed, even if you struck Vettel from the records Webber would have only won two races this term. It is clear that Seb personally is bringing a lot to the party. Further, while we can never know how someone like Alonso, Hamilton or Button would have done with a Red Bull this year, I find it hard to believe they would have beaten the estimable totals accumulated by Seb in 2011. At the very least it wouldn't have been by very far. And this is not just talk. At Hungary this year, after a troublesome Friday Vettel stayed in late with the crew, poring over data, eventually choosing to remove a floor upgrade that was troublesome. Come the next day Vettel had claimed a pole position that looked impossible the day before, and at a vital point of the season as explained. And in the off season, with Pirelli entering the sport as the new tyre supplier, one and only one F1 pilot took the time to visit Pirelli HQ to find out more about the new tyres he'd be using in the forthcoming season. 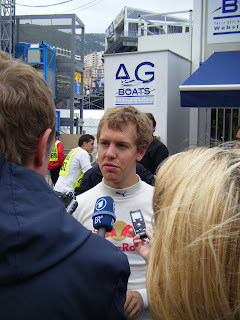 Yes, you guessed it, that guy was Sebastian Vettel. It therefore may not be entirely luck that Vettel appeared to understand what was required from the Pirellis, both in terms of driving style and strategy, right from the season's outset. And a related point, and one which conveniently allows us to deal with the second point that he can't drive under pressure, is that Seb's car advantage in the races this year hasn't been that great. Many scoffed when Seb claimed recently that his car advantage this year is less acute than last, but he may have been onto something. Most of Seb's victories this season have been close, and in many cases he's won under pressure. In Australia Seb's victory margin was 22 seconds and in Valencia the margin to second was 11 seconds, but in all of his other wins his gap to second place at the end was less than 10 seconds, and often much less. Indeed, in Spain and in Monaco he was under pressure from a faster car (and in Monaco, faster cars) for a long period towards the end, and he never made a mistake, nor looked like making one. And his repelling of the threat didn't involved any blocking or weaving, instead he concentrated on avoiding error and having the brain power to be quick at the vital parts of the track where overtaking may be possible. Then there's the idea that he can't pass. Fortunately that idea received a dignified burial after Vettel pulled off an immediate, stunning and brave pass on Fernando Alonso, with two wheels in the grass, to take the lead at Monza. But even before that the evidence was there that Seb bowed to few when it comes to the wheel to wheel stuff. In the opening round he passed Button in double quick time around the outside of Turn 4 during a vital pit stop phase, in Spain after his first stop he passed three cars on his out lap alone, and at Spa he came through the field rapidly after tyre problems necessitated an early stop. This included a pass of Nico Rosberg around the outside of Blanchimont. And if nothing else, if Seb doesn't make passes as often as his rivals that's because he qualifies on pole so often. And no one ever criticised Ascari, Clark or Senna for approaching their racing in a similar way, i.e. dominating races from the front. And as for only being a 'win from the front' specialist, Seb has shown this year, on the rare occasions on which he hasn't set the pace, that he has the brains and ability to bring the car home for good points. This was seen in Silverstone, Hungary. Even in Germany, his one 'off weekend', he took 12 valuable points for fourth place. There have been some predictions of this being the start of a Schuamcher-esque period of dominance by Vettel and Red Bull. In an age of testing bans, resource restrictions, single tyre suppliers, and with the likes of McLaren, Ferrari, Alonso and Hamilton in opposition, that may be unlikely. But Seb's performance this season has demonstrated that rather than being the second Michael Schumacher, he's very much the first Sebastian Vettel. He's a worthy world champion and, a sobering thought for his rivals, he's only going to get better. It is barely possible to find fault with him - and he's 24! No other driver has been so good so soon. Schuey had only won one race by Seb's age! While the Red Bull is fast it's nowhere near a Williams in '92 or a Mclaren in '88. As you point out, Mark Webber is the proof of that. And to be beating a fine vintage of F1 drivers that are fast, experienced and so adept at bringing cars home is something else. He's gone from good to great in 2011, all without losing his charm. Thanks for that. I agree with every word. With all this it's amazing that so many aren't willing to rate Vettel as a great driver, instead seeing him as a good driver in a great car. I think a lot of people's views are turning though!